Hall of Fame running back Eric Dickerson returned as a member of the Los Angeles Rams signing a one day contract Tuesday to officially retire as a Ram. Later, General Manager Les Snead announced the Rams hired the 56 year old Dickerson as Vice President of Business Development. St. Louis! Admit it. You’re worried about the “L.A.” Rams. 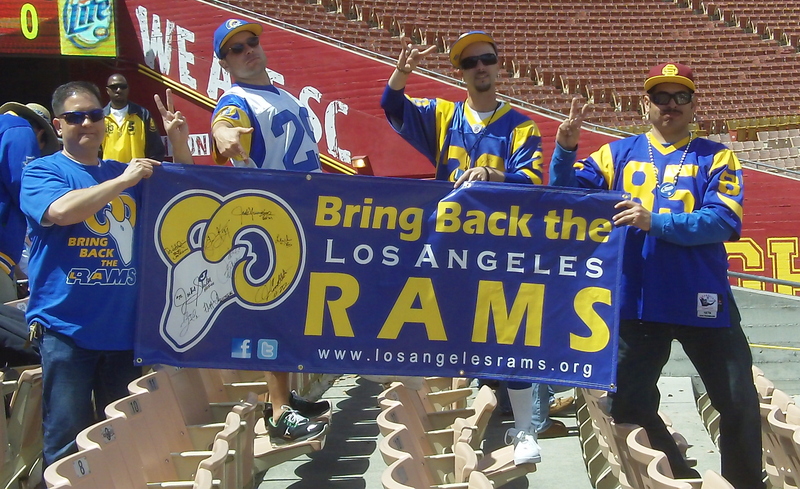 The Bring Back the Los Angeles Rams Facebook page has 25,000+ members. Coming up on 20 seasons without a pro football team, Los Angeles has become a real threat to some other cities that have NFL teams with serious enough stadium issues that they could lose their team to the City of Angels very soon. And they’re worried. Well. One city really is. It’s a real enough threat now to three cities in particular – St. Louis, Oakland and San Diego – because no longer can Los Angeles be used by other cities as leverage by team owners in these cities to pony up a large ransom to build them a stadium on the tax-payers’ dime. That’s because in every NFL city you look at – excluding St. Louis, Oakland and San Diego – they’ve all got a new stadium, are building a new stadium or are up-grading their current stadium. The Raiders are looking to stay in Oakland wanting some sort of stadium upgrade where their current home stands now or maybe even sharing the new Levi Stadium in Santa Clara with the San Francisco 49ers. That’s all pending. Meanwhile, the Chargers – who have been able to leave San Diego for a decade now – still want to hash out a stadium deal somewhere in San Diego – a city the NFL doesn’t want to lose. That’s all pending too. So, that leaves St. Louis – currently home to the Rams, the team that called Los Angeles/So. Cal. home for 49 years prior to bolting for the Midwest in 1995. There’s quite a social media struggle between Rams fans from both cities that, sometimes, gets downright ugly. Rams owner Stan Kroenke – a Missouri native who, the St. Louis partisans like to point out, was named after St. Louis Cardinal baseball greats Stan Musial and Enos Slaughter – has been quiet either way about what’s going to happen after the 2014 season. The end of next season is significant because Gerogia Frontiere and John Shaw, the owner and general manager respectively of the then-Los Angeles Rams who moved the team to St. Louis in 1995, negotiated a “sweetheart lease” when they moved to the Midwest that said if after 10 and then 20 years the Edward Jones Dome isn’t in the top 25% of all NFL stadiums, the Rams become a free-agent able to stay or go where they want. “Sweetheart lease.” YES. For the Rams. Not so much for the city of St. Louis. Back in the early 90s St. Louis had to get a team at any cost because it was believed the Gateway City would be awarded one of two expansion franchises with the other going to Charlotte. The Dome was being built for the expansion St. Louis Stallions when a funny thing happened on the way to the Gateway to the West. The NFL awarded that franchise to Jacksonville Florida instead of St. Louis. St. Louis was getting all dressed up with nowhere to go as the saying goes. Until St. Louis advertising exec and Busch family member James Orthwein came to the rescue. He bought the New England Patriots from Victor Kiam in 1992 and planned to move them to St. Louis after the 1993 season to play in the Dome. Problem is Robert Kraft stepped in. He owned old Foxboro Stadium and wouldn’t let Orthwein out of the stadium lease. So, he sold the team to Kraft. The rest there is history. Luckily for St. Louis, Georgia and John were still looking for the best deal they could get first looking to Baltimore which was without a team since the Colts left for Indy in 1984. Anaheim – or Los Angeles – wasn’t about to spend any tax-payer money to build or remodel stadiums (the Big A & Coliseum) each city still believed was NFL-suitable. So, the Rams bolted from Anaheim at the same time Al Davis took his Raiders out of the L.A. Coliseum and back to Oakland – the Raiders’ original home. That’s when St. Louis stepped in and bent over backwards (desperate after the football Cardinals left seven years earlier for Phoenix after Bill Bidwell wasn’t getting, ironically, a new stadium), giving the Rams anything they wanted just so that dome they built for the Stallions and then the Patriots wouldn’t be empty. Those red seats in the Dome now…….they were put in with the thought that the Patriots were going to be the team. Those red seats were almost deal breakers for Georgia who wanted blue seats. Of course, St. Louis worked some sort of other compromise – added to all the others – in that “sweetheart lease” and those red seats stayed and the Rams moved in. I happen to believe both cities should be represented by an NFL team. If I have to choose between the two, I’ll pick Los Angeles because that’s where I’m from and I’m one of millions that’s been part of its great NFL heritage. 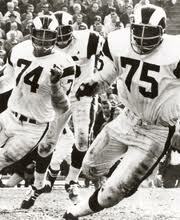 The late Merlin Olsen (74) and late Deacon Jones (75) are part of the Rams 49-year heritage in Los Angeles. A heritage lost – not because the Rams weren’t supported here because, again, they did call Los Angeles/So. Cal. home for 49 years prior to bolting for the Midwest – but because there was no new stadium or an agreement to upgrade existing stadiums in the L.A./Orange County areas. Had the Rams not been supported in Los Angeles, stands to reason they would have left after year five in 1950 and not waited until year 49 in 1995. I can’t speak about St. Louis because I’ve never been there. So, I’ll refrain from commenting about the Gateway City – good or bad – because I just don’t know much about St. Louis. Here’s what I know about some media types and football fans in St. Louis. When they speak about Los Angeles, they have no idea what they’re talking about. Sorry, St. Louis. You’re wrong. See five paragraphs above. Or better yet, click on the video-link to hear from one of the TV voices of the NFL, Al Michaels. I asked him about….well…..just listen. So, stop using the “L.A. can’t support an NFL team” card, St. Louis. That’s not a reason. It’s an excuse. That goes for anyone, anywhere that’s used that excuse about L.A. I have no idea – nor does anyone, anywhere, in any city especially in St. Louis and Los Angeles – what Stanley Enos Kroenke will do after the 2014 season because he hasn’t said anything either way. What I do know is Stanley Enos Kroenke – the St. Louis native – made a strong bid to buy the Los Angeles Dodgers two years ago and has a home in Malibu. What does that mean? Probably as much as Stanley Enos Kroenke being named after St. Louis baseball Cardinal legends Stan Musial and Enos Slaughter. What speaks volumes is the NFL is staying out of it at the moment. Commissioner Roger Goodell isn’t flying to St. Louis to speak to the STL government entities – like he did in Minneapolis to save the Vikings from moving out west – to save the Rams from moving out west. And Stanley Enos Kroenke is living by the letter of the law on that “sweetheart lease” negotiated way back when by John Shaw and a desperate City of St. Louis to put a team in the Dome they originally thought would be for the Stallions. Seems it’s a 50-50 proposition. Los Angeles has Farmers Field ready to be built by AEG as soon as a team says we want to move to L.A. Surely. no city government anywhere in the world – let alone this country – would commit millions and millions, even billions, of dollars to build a stadium without securing a team to play in it first, right? Oops. Sorry, St. Louis. Does that hit too close to home or hit you below the proverbial belt? Los Angeles, its government and her tax-payers aren’t that stupid. Oops. Sorry again, St. Louis. St. Louis still has the Rams playing in the outdated EJD and with the hopes Stanley Enos Kroenke will, at the last minute, pay for a new billion dollar stadium out of his own pocket to be built in a place called Fenton or the Bottle District. 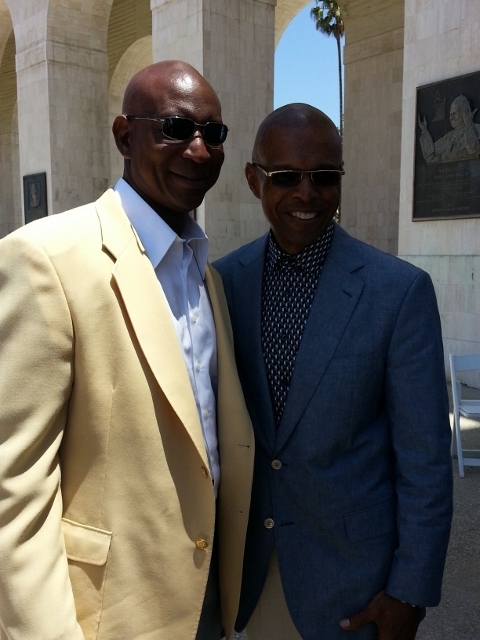 Former L.A. Rams running back Eric Dickerson (rt) and former Bears running back Gale Sayers (lt) at the Deacon Jones Memorial Service at the L.A. Coliseum last Summer. Some St. Louis “bloggers” also like to cite a five-year old comment by former Los Angeles Rams hall-of-fame running back Eric Dickerson saying Los Angeles doesn’t deserve a team. You’d say that too if you still felt some resentment towards Georgia and John Shaw if you had been underpaid telling your coach to run “47-gap” himself. Of course, he’s since retracted those comments and has said many times – including on the NFL Network – Los Angeles needs to have a team. Although he played for three other teams after being traded from the Rams in 1987, two years ago Eric told me he’s a Ram for life no matter where they call home. Then, after discussing the Rams are one of the teams that could possibly move to Los Angeles, I asked him what that would mean to him and the rest of the ex-Los Angeles Rams players. So, St. Louis, stop using the “Eric Dickerson doesn’t think L.A. deserves a team” card. It simply isn’t a reason. It simply isn’t true. As I said earlier, I think both cities should be home to NFL teams. No one cared about St. Louis when the Cardinals left. No one cared about Los Angeles when the Rams and Raiders left at the same time. No one’s going to care either way – except for those in St. Louis and Los Angeles – when something’s done with the Rams once that “sweetheart lease” runs its course after 2014. But those “bloggers/writers/journalists” from St. Louis at some point have to admit there’s a possibility the Rams could leave for Los Angeles after 2014 just like I admit that Stanley Enos Kroenke could pull a billion-dollar rabbit out of his hat with help from the NFL’s G-4 LOAN –which is a loan to be repaid by somebody (tax-payers) – to build a stadium somewhere in Fenton or the Bottle District. Where ever those places are. But let’s stop using the “L.A. never supported the NFL” card and the “Eric Dickerson doesn’t think L.A. deserves a team” card. Both are simply not true. Playing those cards you look as stupid as a city committing millions and millions, even billions, of dollars to build a football stadium before securing a team to play in it. What is true is that St. Louis football fans and St. Louis “journalists” are very worried. Until after the 2014 NFL season everyone!! Enjoy the remainder of that “sweetheart lease,” St. Louis!